Where Will Cameco Corporation Be in 5 Years? Are the uranium markets at an inflection point, or will Cameco investors have to wait longer for a turnaround? We continue to focus on what we can control. -- Tim Gitzel, president and CEO, Cameco Corp.
Gitzel's quote above from Cameco's (NYSE:CCJ) recent quarterly earnings release pretty much sums up what's happening at the uranium mining giant. As a nuclear fuel pure-play, Cameco was among the worst-hit companies when the 2011 Fukushima Daiichi nuclear disaster in Japan brought the construction of nuclear reactors worldwide to a grinding halt. Japan shuttered all of its more than 50 reactors, nations across the globe mothballed projects, demand and prices of uranium slumped, and the uranium industry is still trying to find its feet. 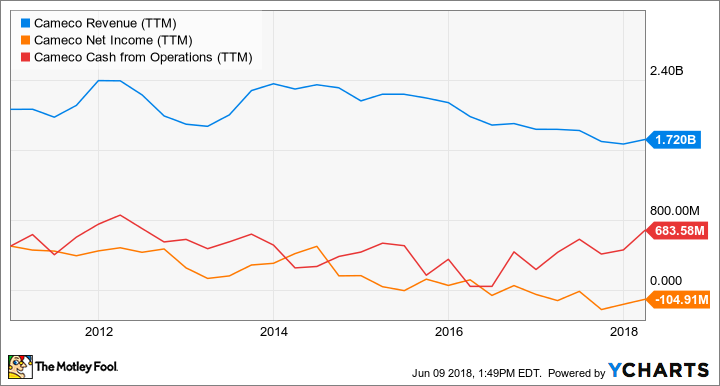 Remarkably, if you didn't know the backstory and looked at Cameco's operational performance over the years (see chart below), you'd never believe that the company -- and the industry -- were almost written off seven years ago. Cameco remained profitable through the downturn only until 2016, when impairment charges pushed its bottom line into the red. Yet, Cameco's operating cash flow for the trailing 12 months was at multiyear highs. The starting of nuclear reactors worldwide is a positive sign for Cameco. Image source: Getty Images. So, where exactly is Cameco headed, and where could it be five years from now? Cameco shares have had a solid run-up so far this year, piling on nearly 27% as of this writing, thanks to impressive operational numbers despite the depressed end markets. It's not a fluke, but what matters is whether the Canada-based uranium miner's good run can continue. That's when things get interesting. CCJ Revenue (TTM) data by YCharts. In its first quarter, Cameco reported 12% higher year-over year-revenue and earned a net profit of 5 million Canadian dollars compared with a loss of CA$18 million in the year-ago quarter. The bulk of the profit growth came from two sources: a one-time gain on the restructuring of a joint venture and higher average realized prices. The second part is where all of the action lies. You see, uranium deliveries at preset prices under long-term contracts have been the savior for Cameco so far as nearly 40% of the company's sales are contracted, while the remaining are spot-price driven. That explains Cameco's high realized sales prices and revenues despite spot uranium prices hovering at multiyear lows of $21 to $23 per pound in the past six months. For perspective, spot uranium was trading above $50 a pound until mid-2012. Cameco still has some contracts running, which is why its fiscal 2018 guidance looks encouraging. All figures are in Canadian dollars. Data source: Cameco financials. Two numbers from the above table that warrant attention are administration costs and cash flows, as they also hold the key to the company's growth even as it awaits an industry turnaround. Redirect key resources to profitable assets. Align production and inventory with end market conditions. Extend long-term contracts for better revenue visibility. Maintain a strong balance sheet, sustain an investment-grade rating on debt, and maximize cash flows. In a bold move late last year, Cameco suspended operations at key mines McArthur River and Key Lake. So, in fiscal 2018, the miner expects to produce only around 9.2 million pounds of uranium and fulfill the rest of its sales commitments by drawing down inventory and buying uranium at spot prices to resell. It's a shrewd business move that's not only cost effective, but also frees up cash as inventory eases. Meanwhile, Cameco also cut its dividend by nearly 80% last November to prevent further cash burn. Cameco's efforts are paying off, as is evidenced by the lower administration costs and the surge in its operating cash flows. The miner expects fiscal 2018 to be just as strong, yet the stock is trading at only 6.7 times cash flow. That looks dirt-cheap, but there are risks. There's only so much Cameco can do to lower costs, and growth will be hard to come by if buyers (nuclear utilities) don't jump back into the market soon. For now, Cameco has annual delivery commitments of around 22 million pounds of uranium for only five years. It's therefore imperative that demand picks up before Cameco's sales run dry. Meanwhile, there's hope that the ongoing production curtailments at Cameco and Kazatomprom -- the world's largest uranium producer -- should help balance demand and supply in the near future and boost uranium prices. With several nuclear reactors coming online globally, a price recovery is inevitable. The big question is, when? There are too many moving parts, and a recovery could take longer than you and I expect. For investors in Cameco, it'll likely be a bumpy ride. Cameco is a well-run company with the backing of a management team that's more proactive than reactive, and that's likely to keep the stock humming in the coming years. In between, watch out for uranium prices. Even the slightest signs of a recovery could mean solid returns for Cameco investors five years from now.